UFCW Canada members are celebrating a successful online pressure campaign that compelled Benetton to compensate victims of the Rana Plaza tragedy. UFCW Canada members, labor and community activists, and concerned citizens around the world are celebrating a hard-won victory for justice after a successful online pressure campaign that compelled Italian fashion company Benetton to compensate victims of the Rana Plaza tragedy in Bangladesh. Benetton confirmed that it will compensate victims of the 2013 Rana Plaza building collapse that killed and injured thousands of garment factory workers laboring inside the plaza. The announcement is a remarkable reversal for Benetton, which for two years resisted paying into a fund led by the United Nations for the 5,000 victims and survivors of the deadly accident. Benetton’s agreement is a direct response to a campaign that had more than one million citizens around the world urging the company to join the Rana Plaza Donors Trust Fund. The Italian fashion company agreed to contribute to the fund before April 24, the second anniversary of the accident. The ground breaking multi-stakeholder fund requires $9 million to ensure all victims and survivors receive compensation for lost wages and medical expenses. 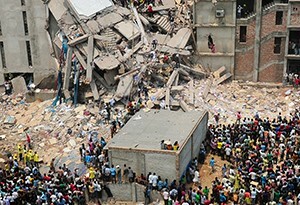 The Rana Plaza disaster took the lives of 1,134 people and left 2,515 survivors injured. In response to the tragedy, the Rana Plaza Donors Trust Fund was established to bring together the Bangladesh government, local manufacturers, global clothing brands and retailers, local and international trade unions, and international NGOs to set a new standard for compensation. The fund is chaired by the UN’s International Labour Organization (ILO). In accordance with international standards, the coordination committee underwent a comprehensive and independent process to assess the assigning claims for 5,000 victims and survivors as an entitlement for medical expenses and financial support. In the wake of the disaster, UFCW Canada was a leading voice in calling for victim compensation and improved building and workplace safety in Bangladesh, and was quick to acknowledge companies – such as Loblaw – that signed the Bangladesh Accord on Fire and Building Safety and supported the Rana Plaza Donors Trust Fund. UFCW Canada National President Paul Meinema also traveled to Bangladesh last year to meet with trade unionists, health and safety experts, and survivors of the Rana Plaza tragedy and express solidarity with the building collapse victims. “While it is encouraging that Bennetton has agreed to compensate the victims of this horrible disaster, we must continue to demand that companies which source products from Bangladesh – like Walmart and Target – sign the Bangladesh Accord,” said President Meinema. “The Harper government must also press Bangladeshi and Canadian retailers to respect the Accord, assist the families in rebuilding their lives, and ensure that a tragedy like the Rana Plaza never happens again,” Meinema added. 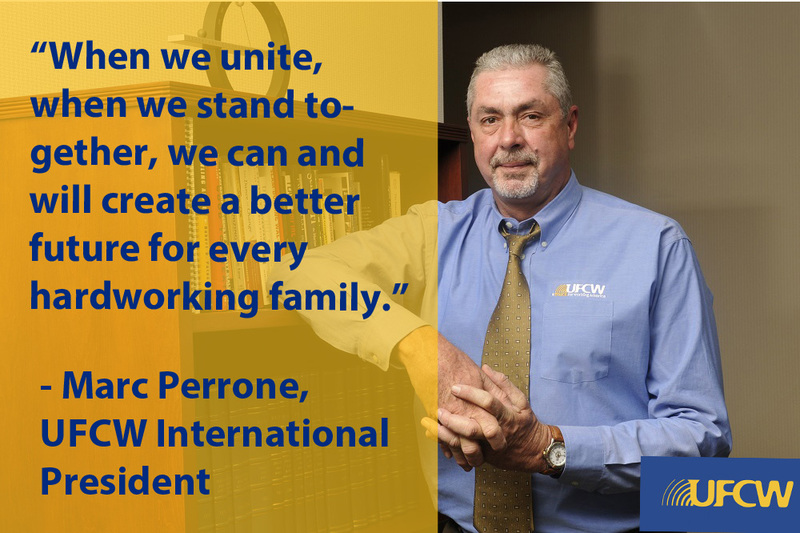 Yesterday, former UFCW International Secretary-Treasurer Marc Perrone, was elected International President at a board meeting held in Chicago, Ill.
Perrone will spend the coming weeks and months meeting with UFCW members throughout the United States and Canada. 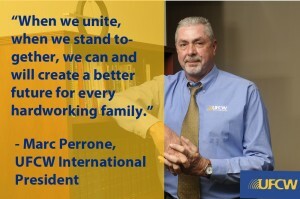 As part of this listening tour, Perrone is planning one on one conversations with members, worksite visits, and the utilization of digital and social media platforms to engage with union members to hear their thoughts and ideas on how the UFCW can grow even stronger. Perrone succeeds retiring International President Joe Hansen. During his tenure, Hansen increased union density in meatpacking and processing, formed important global labor alliances, and helped lead the labor movement’s positions on comprehensive immigration reform. Under the UFCW International Constitution, the International Executive Board is charged with electing a replacement for a vacancy in the office of International President. The UFCW Executive Board consists of 50 International Vice Presidents, primarily local union leaders, and five Executive Committee members. The UFCW International Executive Board also elected former Executive Vice President Pat O’Neill as International Secretary-Treasurer, Stuart Appelbaum as Executive Vice President, and Esther Lopez as Executive Vice President. Paul Meinema currently serves as Executive Vice President and National President of UFCW Canada. Executive Vice President Bill McDonough retired on October 31.